Every now and again, I'll look through my web logs and see how folks are getting to my site. Most of it is through the various forums I visit, but quite a bit comes from google image searches. I have hundreds of images stored on my site, most of which are my welded figurines, and project updates and the such. I don't mind people getting to my site from google searches. What I mind is people leeching my images without my permission. 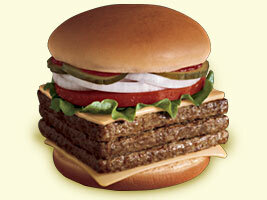 The most leeched image from my site, oddly enough, is the Wendy's Triple Classic image from a post I made back in 2005. For some reason, this thing has gotten passed around from forum to forum, often in the context of "wow - this is a lot of burger" or some such. Most recently, it was used in a terribly meaningful post about someone trying to figure out what to eat. 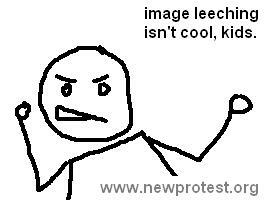 I've swapped out the image with another one, as a friendly reminder that image-leeching is rude. I thought about using a more-shocking image... something borderline vulgar or inappropriate-for-young-children, but I opted against it. I'll play nice.